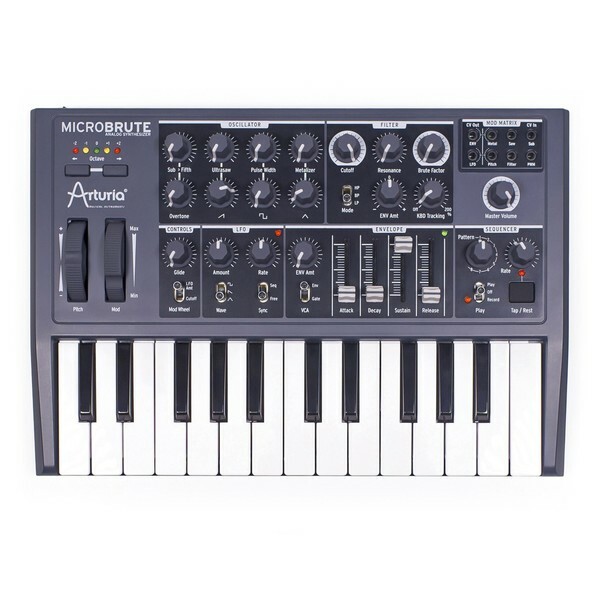 The Arturia MicroBrute Semi Modular Analog Synth is a sonic powerhouse that delivers the pure analogue sound. 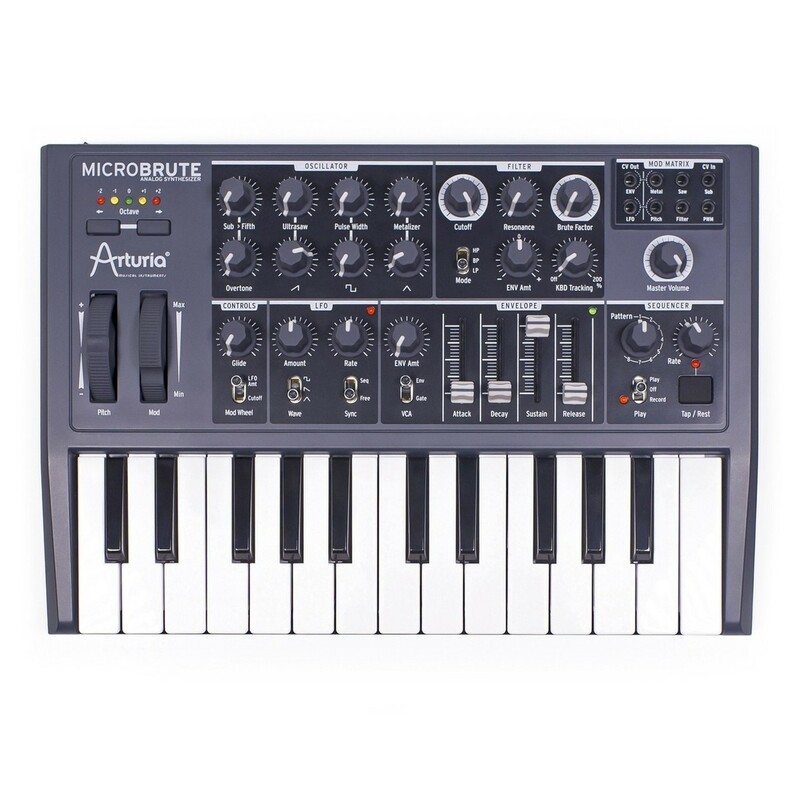 The Arturia MicroBrute is compact, allowing for easy portability, and is jam-packed with features for sound design. Its small size may fool you, but on the inside it has the ability to create fat, chunky bass lines, and soaring leads, enough to vibrate the dancefloor. Complete with 3-mode filter cutoff, ADSR, LFO, mod matrix, and a range of waveforms, the Arturia MicroBrute packs a brutal punch, and a vast amount of sound design ability. The MicroBrute is sure to add more power, and a new range of aggressive sounds to your studio's sonic palette. It looks tiny, but sounds massive. Packed with mixable waveforms and a new sub oscillator design, the MicroBrute is a landmark new synth. Features include the famous Steiner-Parker multimode filter, superfast envelope, syncable LFO and a new step sequencer. There's even a patchable mod matrix!There are no presets and no menus, nothing to get between you and your ability to sculpt your sound live. Be completely original every time you create and perform, with astounding sound quality. The Voice path on the MicroBrute is 100 percent analog. Not digitally-controlled analog, not digital oscillators with a wave shaper, but true, honest analog. The MicroBrute has the same sort of rich, warm sound found in its award-winning big brother. The MicroBrute has a sound that will never go out of fashion or become stale, just like the many true analog classics that have stood the test of time. The MicroBrute oscillator generates multiple wave shapes at one time. The wave mixer allows you to blend these different waveforms in varying levels to create a variety of sounds that's unending. The MicroBrute oscillator doesn't hold back on sonic capabilities and allows you the freedom to create your own sound. Arturia have included special wave shapers on every waveform to boldly expand the sonic range further. Overtone is the newly-designed Sub oscillator and it's much more than a typical sub. Overtone goes further by having a harmonic control which increases the upper overtones until the pitch finally reaches a full 5th above the root oscillator. Arturia chose the winning combination of the Steiner-Parker filter for the MicroBrute. Known for having its own distinctive sound and a huge range of tonal options, the Steiner-Parker is a staple filter of the modular synth world. There are three modes - Low pass, Band pass and High pass. Combining this filter with the amazing oscillator will give you a lifetime of sound-sculpting options. The Brute Factor makes the MicroBrute one of the most aggressive-sounding analog synths around. The controllable circuit can give you a saturated and enhanced low end sound at low levels, and wreak havoc on soundsystems everywhere at high levels. Change the default mod routings and create your own patches for a whole new arena of sound possibilties. This opens up the MicroBrute to being much more than just a compact synth. 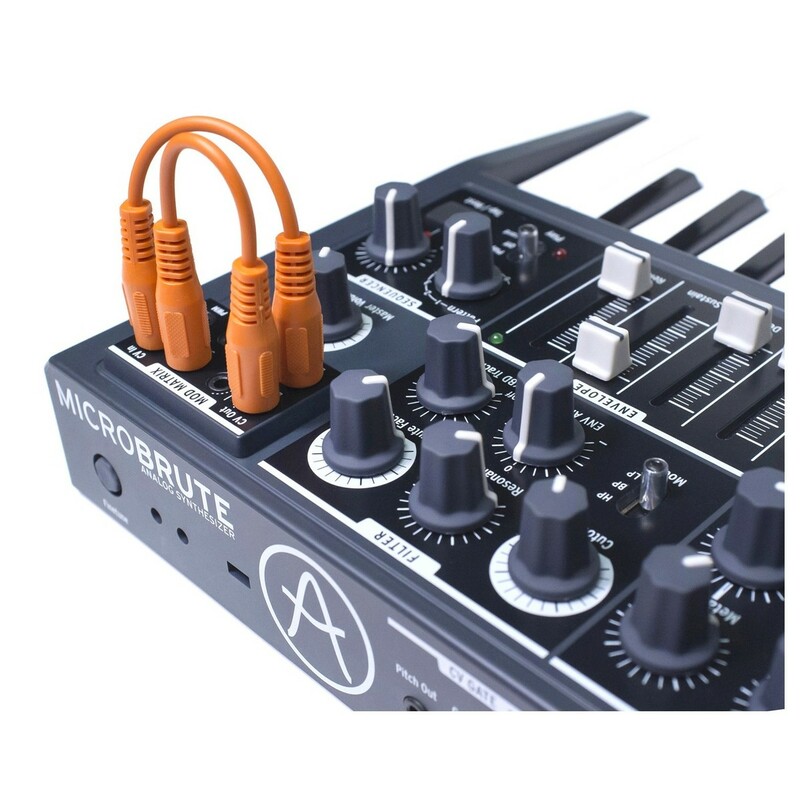 The MicroBrute works well as an expander and can become a controller for modular synths. 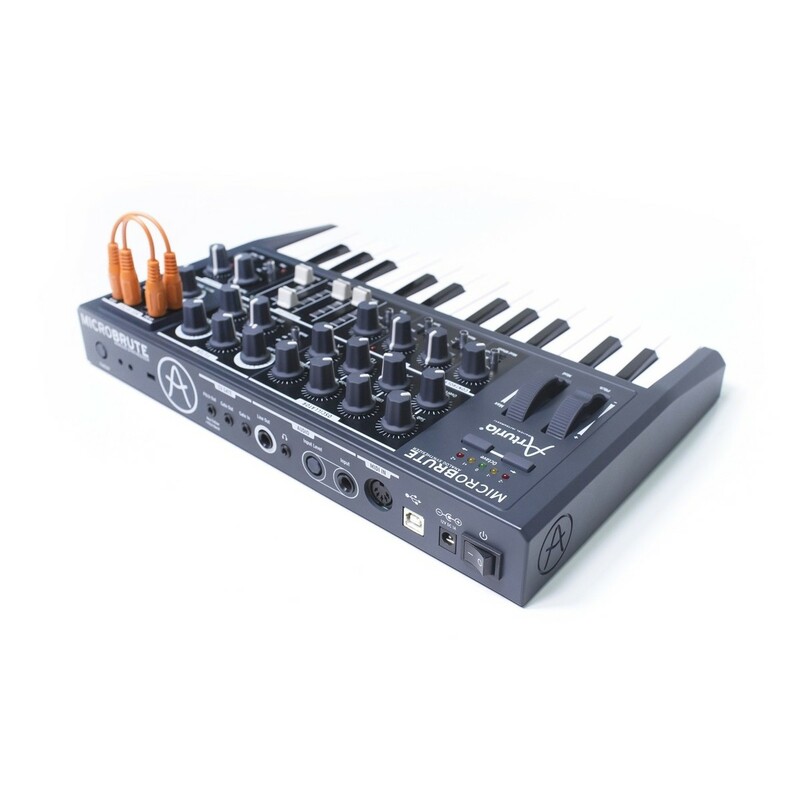 The MicroBrute features an integrated LFO offering square, triangle, and a sawtooth waveforms. Controls for the LFO rate and amount allow you to modify the speed and amount of modulation, providing flexibility. The LFO can be free running, or it can be synced to the internal sequencer. The MicroBrute also features a built-in sequencer. The sequencer allows you to make quick and creative patterns with ease. It has 8 sequences that can be up to 64 steps each, and you won’t lose them when the power has been turned off. You also have the ability to create a sequence, then tweak your sound, LFO, and more whilst it is playing. The sequencer is ideal for creating ideas. You can of course record your own patterns in, record them, and play them back at different tempos. 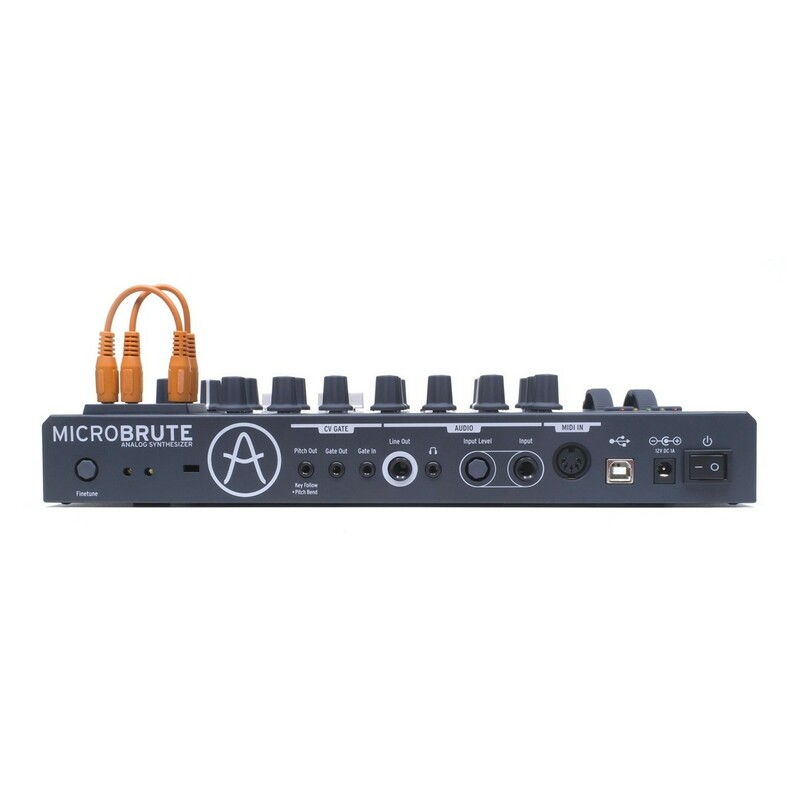 The MicroBrute also features MIDI IN and USB IN inputs that allow you to sync up the sequencer to external gear or your DAW.